Performance and video screening at Iwalewahaus, Bayreuth, Germany 27 Nov – 7 Dec.
At Iwalewahaus for a 3 day festival/ screening of ‘The film will always be you’ curated by Abrie Fourie​ and Zoe Whitley​ as of this Saturday. Then for some mischevious fun with a dark performance as part of the conference program for ‘Art of Wagnis’ dedicated to the life and work of provocateur Christoph Schlingensief. Little known outside of South Africa, the Johannesburg Free Filmmakers Cooperative was a loose association of filmmakers in the 1980s, among them artist William Kentridge. The very act of filmmaking as a vital outlet for self-expression caused Kentridge to recognise that ‘you yourself will be the film and the film will always be you.’ This three-day programme of screenings launches with Free Filmmakers’ experimental 1986 documentary and is followed by a selection of 25 contemporary artists’ shorts rarely or never before seen in UK. The Saturday and Sunday screenings will each culminate with artists in conversation, reflecting on the changing role of the moving image in art and how the medium expresses new subjectivities. The series demonstrates the substantial legacy of South African artists on screen. This project has been supported by the SA–UK Seasons 2014 & 2015, a partnership between the Department of Arts and Culture, South Africa and the British Council. Die titel vir dié versameling kortflieks deur Suid-Afrikaanse kunstenaars ontleen Abrie Fourie aan die gelyknamige 1991-animasiefliek van William Kentridge. Dié fliek is deel van Nine Draw­ings for Projection (gemaak tussen 1989 en 2003) waarin die verhaal vertel word van Soho Eckstein as sakeman (en in Mine as myneienaar). In dié flieks word verskeie aspekte van myn of mine ontgin: die diepgroefmyn waaruit Eckstein sy rykdom buit; die toeëiening van dit waarop die hande gelê kan word; maar ook die woordspel met “ondermyn”. Myn as aanduiding van posisionering en identiteit kom uiteraard ter sprake en dit is dalk dié gedagte wat deursyfer in die werke van die 18 ander kunstenaars. Benewens Kentridge is daar die werk van Bridget Baker, Dineo Seshee Bopape, Doris Bloom, Jacques Coetzer, Teboho Edkins, Simon Gush en Dorothee Kreutzfeldt, Donna Kukama, Michael MacGarry, Nandipha Mntambo, Zanele Muholi, Cedric Nunn, Robin Rhode, Berni Searle, Lerato Shadi, Penny Siopis, Gregg Smith, Johan Thom en Minnette Vári. Vári se Alien spook jare later (en nog net so sterk soos in 1998 toe dit gemaak is) met vreemdelingskap en vervreemding. As sy toe aspekte soos vrees, begeerte, besit, verlies en ’n bewussyn van die self teen die agtergrond van ’n onderdrukkende regime verbeeld het, is haar Alien nou allermins vreemd. Fourie se samestelling van die uitstalling – wat ook vertoon is in Bayreuth, Duitsland, en Dubai, Verenigde Arabiese Emirate – is besonder behendig gedoen. In stede van oorhel na die swaarmoedige sluit hy op speelse wyse ook die anargistiese werk in van Rhode en die melancholiese Temporary Rebellion (2008) van Coetzer. Dié dokumentasie van ’n openbare performance op die N1 vergestalt iets van die individu se insulêre bestaan buite die hoofstroom. Neffens die bedrywige oggendverkeer op die snelweg sit ’n tromspeler en speel sy hart uit. Fourie se uitstalling verg dat ’n mens tyd moet bestee, meer as wat die gemiddelde besoeker aan ’n galery wel doen. In die konteks van die uitstalling tree die onderlinge werke met elkander in gesprek en kry die individuele werke ’n aanvullende betekenis. From the viewer’s perspective, video installations can be a tricky medium to wrap your head around. The content is often obscure and indecipherable, and it’s all to easy too walk away feeling more than a little confused. 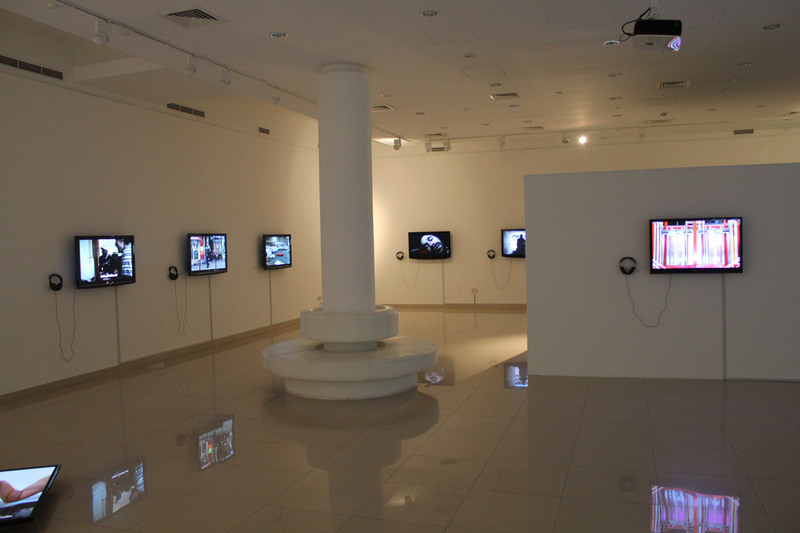 However, if you’re armed with some background knowledge on the artist and their intentions, video installations can be a rewarding and fascinating art form. 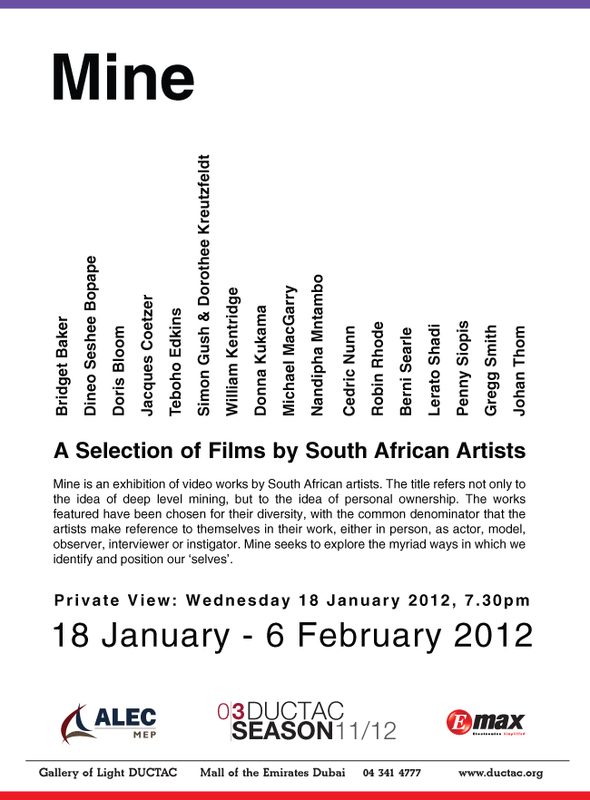 One such exhibition, entitled ‘Mine’ (showing at Ductac’s Gallery of Light), presents video installations of 17 South African artists (including well-known notables William Kentbridge and Robin Rhode), in which they comment on personal ownership. Each artist also appears in his or her film. To help you understand the pieces, we asked five of the artists. to give us an insight into their work. In short, it’s a work in which I wanted to express something about the relationship between domesticity, art and the subconscious. For most of my career my home has also been my studio. There’s something interesting about the way in which art is simultaneously very personal and social, domestic and public. I think we ought to carefully examine the myriad ways in which ideas about dirt and cleanliness figure so prominently in the way we structure and understand the meaning of our lives. Where do you appear in the film? I appear made up in ‘skullface’, as a delirious character that seems to celebrate the material messiness of life even from beyond the grave. The ingenuity of ordinary people. Do you have a favourite filmmaker? I love film generally, and three names come to mind immediately: Steve McQueen, Bill Viola and Werner Herzog. What makes you proud to be South African? We are a hybrid, multicultural nation. Also read Robin Rhode, Bridget Baker, Lerato Shadi and Jacques Coetzer’s pieces in the Time Out by clicking on this link: South African video art. 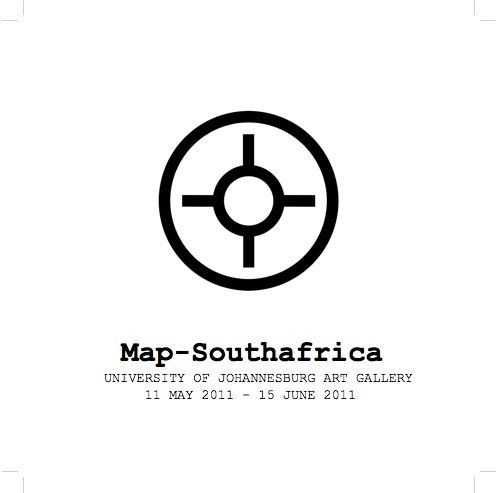 An exhibition entitled Map – South Africa with works from a broad spectrum of artists and genres will be hosted by the UJ Art Gallery from 11 May to 15 June 2011. In addition to showing new work by 39 artists who have participated in Map, the exhibition documents the diverse spaces utilised for the Map projects all over South Africa. These spaces include restaurants, hotels, homes and Map’s own Karoo residency. The show also records Map participation in the 2007 Innibos arts festival and an architecture conference: African Perspectives 2009: ‘The African City Centre (re)sourced’, hosted by the University of Pretoria, as well as publications relating to these projects. The founders of the project, patron of the arts, Harrie Siertsema and Abrie Fourie, well known artist and curator, brought a fresh and innovative approach to the domain of visual arts through this ongoing project and through their unwavering trust in and support of South African artists. The multifaceted Modern Art Project (Map) originated in 2005 out of the impulse to combine the works of established and emerging artists and to show such works in unexpected spaces outside the traditional gallery context. Map is emblematic of a new ‘empathetic economy’ in which the artwork is taken from the white cube gallery for more democratic dispersement, and brought back to the white cube for documentation and integration. Map also points to the destruction of the division between high and low culture. The Map endeavours are documented in an exceptional series of “black books” available for public perusal. This informative resource is also a collector’s item as a limited edition “black box” set.